The Cobra King gulet is a high standard deluxe class wooden Turkish yacht based in Bodrum. She accommodates up to 12 guests in 1 master, 2 double, and 2 twin cabins which make her ideal for multi-family and couples only groups. All cabins provide an LCD TV, DVD player, air-conditioner and spacious bathrooms laid with marble. Sound-insulated, thick mahogany walls ensure that blue cruise passengers wake up peaceful and fresh in the morning. The exquisite gulet Cobra King is constructed with laminated mahogany and it is a luxurious yacht with an oak frame. 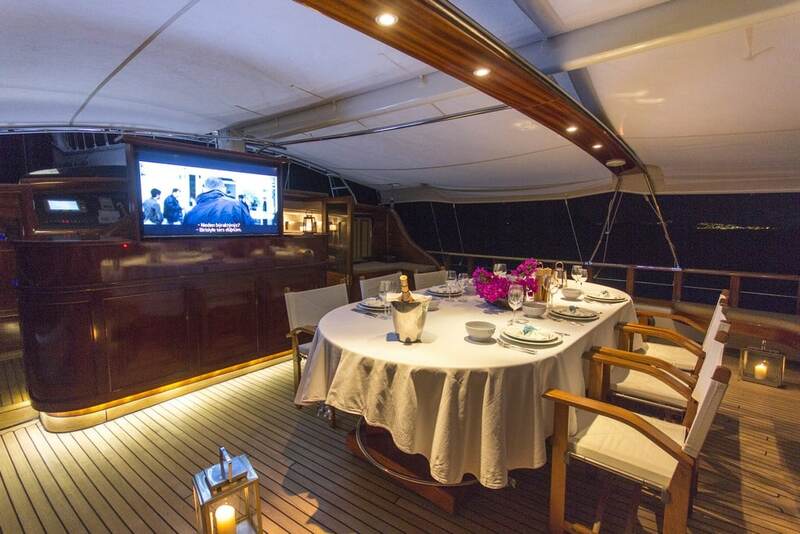 She sails on the seas like a work of art with its 38.60-metre length and 8-metre beam and teak decks. Its interior design was styled by Dara Kirmizitoprak. The spacious saloon contains a comfy L-shaped sofa set and a large dining table. The corner entertainment centre that includes a plasma TV, DVD player, and HI-FI stereo system offers entertainment. There are onboard water sports including a wakeboard, water ski, kneeboard, ringo, canoe, and fishing and snorkelling equipment for those who want to have fun during their blue cruise holidays. The traditional Bodrum gulet, Cobra King is served by a crew of 5 professionals offering high-quality service for maximum guest satisfaction. Offering an unforgettable blue cruise experience to its passengers on the Aegean and Mediterranean coast, the captivating Cobra King is furnished with the comfort of a floating hotel. Contact Mirya Yachting for availability to start planning your blue cruise holidays in the Mediterranean.